- O.S. on 五月 2, 2015. “Let Life Surprise You” is this year’s theme of Veuve Clicquot’s “Yelloweek” (May1 to May 7, 2015), which was launched at the Thompson Rooftop Lounge in Toronto last night! This festival celebrating one of the leading brands of champagne is also running simultaneously in Montreal, Vancouver, Calgary and Edmonton. The Thompson Rooftop Lounge was decorated in astro turf, white plastic daisies and an assortment of black cushions on the lounge seating in contrast to the Veuve Clicquot’s yellow accessories. Each guest was greeted by a tray full of yellow glasses filled with Veuve Clicquot champagne upon entry, and offered yellow sunglasses to wear. Mini quiche, chicken skewers and lamb chops were passed around to go with the Veuve Clicquot. During the week, Veuve Clicquot will be sold by the glass at the city’s most stylish venues. “Yellow by the Glass” restaurant partners include Blowfish on Bay, Michaels on Simcoe, Marben, Toca, Via Vai, Cibo, Woods, Carens Wine and Cheese, Hot House Restaurant and Bar, La Societe, Weslodge, Portland Variety, Barssai, Buonanotte, Square and the Ritz Bar. In addition, America and some of the restaurants above will be pairing Veuve Clicquot champagne with dinner to host “Yellow Table”. Hotel Le Germain at Maple Leaf Square is the designated “Yellow Hotel”. “Yelloweek” is inspired by the founder of Veuve Clicquot, Barbe-Nicole Clicquot Ponsardin, who in 1805 became a widow (la veuve) at 27 years old and took over her husband’s estate to create this successful luxury brand known around the world over two hundred years later. 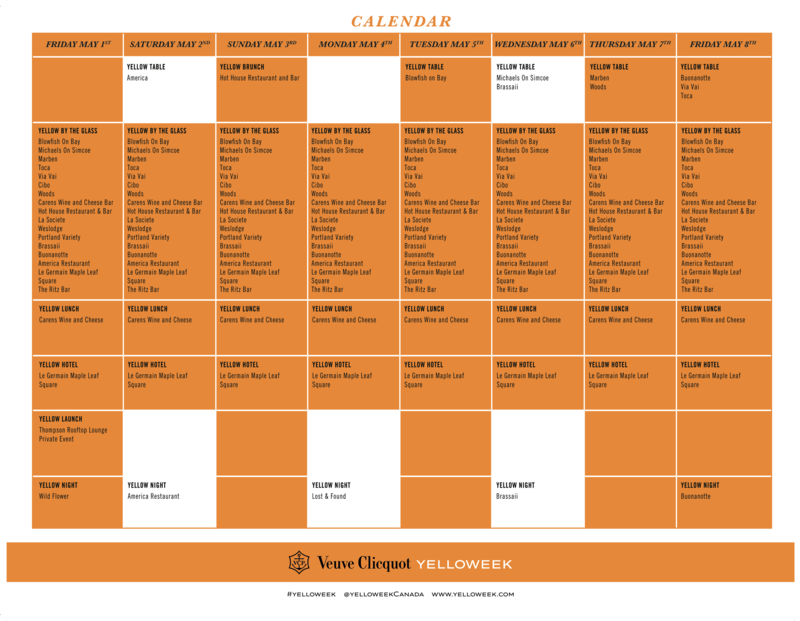 To see the full schedule of “Yelloweek” events, please click here. « Analogue Gallery Kicks Off CONTACT Photography Festival with Women In Rock Exhibition.